In early July ’17 I rode the Raid Pyrenean. This is a 720Km bike ride across the Pyrenees from the Atlantic to the Mediterranean. It crosses 18 cols or mountain passes, with a total altitude gain of 11,000 meters. All done in four and a half days. Put another way, that is an average of 100 miles per day, with an average daily vertical of 8000 feet. The trip was supported by Marmot Tours who arranged accommodation, carried our non-cycling kit in two vans and stopped along the route so that we could top up with water and food. There were 19 riders in all and the four Americans, two Finns, one Columbian and one Hong Kong resident gave the peloton a truly international flavour. The route was primarily along minor roads and so we passed idyllic Pyrenean villages, rode through forests and limestone gorges, alongside mountain streams and waterfalls, with mountain peaks all around. And then there were the climbs: Aubisque, Aspin, Peyresourde and Tourmalet, to name but a few, which will be familiar to Tour de France fans. 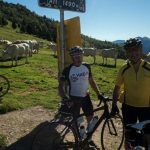 The climbs to these famous cols varied between brutal and just a bit of a slog. The camaraderie of the peloton with the endless banter and encouragement took away a lot of the pain. The ride was not without incident: One of the Finns came adrift on gravel on the descent of Tourmalet and had a head injury serious enough to warrant a CT scan, which thankfully was negative. His abrasions and lacerations were patched up and the next day he was back on the bike. True Grit! Another rider took a wrong turn, and just kept going. He got so spectacularly lost he had to get a train to a point where the support team could pick him up. My low point came on Tourmalet where temperatures were in excess of 30 deg. C and I had an episode of cramp. I worked through it and kept going. The whole episode lasted no more than a couple of minutes but seemed like forever, and during this time I really felt I was on the ropes. There was a time when HAE might have stopped me in my tracks. The risk of this is now greatly reduced thanks to advances in drug treatment, pharmaceutical companies prepared to research and develop these drugs, brilliant nurses and physicians and HAEUK to support and guide us. I wore my HAE UK bike jersey with pride and, as a bonus, funds have been raised.